We reported on our first mass trend results for Greenland using a BHM approach earlier in the year but highlighted that the BHM was not allocating the total change correctly between the two main contributory processes, ice dynamics and surface mass balance. This led us to re-think about how best to implement the BHM for Greenland, and ultimately to change from an annual to a monthly timestep. Since the surface mass balance has a strong seasonal cycle in Greenland (summer melt and winter accumulation), this provides us with a reliable way of separating it from the ice dynamic signal, which is far less influenced by season. It did, however, require a considerable amount of effort rewriting model code and reprocessing datasets. We were grateful to welcome project partner Dr Andrew Zammit-Mangion from University of Wollongong, Australia, to Bristol for a month during the autumn, who provided help with the implementation of the monthly timestep. The new monthly set-up is being tested initially for a single basin, Jakobshaven Isbrae, and for a single year, 2007. Early results are encouraging (see figure below), and we hope to scale it up to the entire Greenland ice sheet for a longer time period in the coming months. 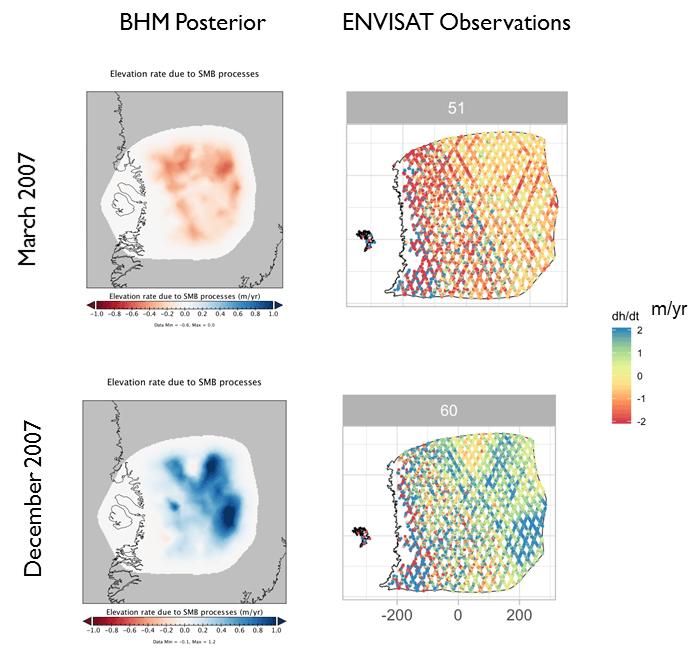 Predicted change in ice elevation due to surface mass balance (SMB) processes from the BHM (BHM posterior) compared to observed ice elevation change from the ENVISAT satellite for two months (March 2007 and December 2007). In addition, and although not a central part of the GlobalMass project, in early 2018 we helped organise a structured expert judgement (SEJ) exercise to explore the current uncertainties in ice sheet contributions to sea level rise. The potential contribution of the ice sheets remains the largest uncertainty in projecting sea level rise beyond 2050 due to limitations in the predictive capability of numerical modelling approaches. SEJ represents an alternative approach which provides a formal approach for estimating uncertain quantities based on current scientific understanding. Two workshops were conducted to elicit estimated future ice sheet contributions for four time periods (2050, 2100, 2200, 2300) and two temperature scenarios for the Greenland, West Antarctic and East Antarctic ice sheets. A paper that provides full details of the approach and the results obtained is currently in review. We have recently produced our first mass balance trends results for Greenland using the BHM framework. However, applying a method developed for Antarctica (in the RATES project) to Greenland has proved more complex than we anticipated. This is mainly because the nature of the processes that govern ice accumulation and melt are very different, requiring them to be incorporated differently and necessitating much code to be rewritten. While the overall mass trend now appears sensible (and fits well against other published studies), a ‘source separation’ issue remains whereby the BHM is not allocating the total change correctly between the two main contributory processes, ice dynamics and surface mass balance. Work is ongoing to develop a method for better separating these processes and to therefore provide more robust results at both ice sheet and basin scales. Considerable progress has been made with regards to using a BHM approach to understand ice mass trends for Antarctica and Greenland. Using a BHM framework allows us to produce statistically-rigorous estimates of ice sheet mass balance and the contribution of component parts at the drainage basin scale. 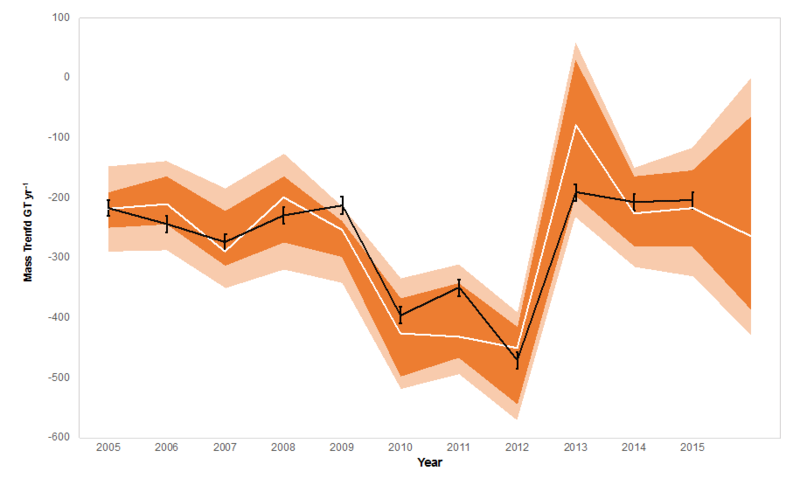 Error-bounded estimates of Antarctic ice mass balance trends have now been obtained for 2003 to 2015 (an update of RATES project), and we have recently started to apply the BHM framework to explore mass balance trends for Greenland.